An ombudsman (conventional English plural: ombudsmen) is a person who acts as a trusted intermediary between either the state (or elements of it) or an organization, and some internal or external constituency, while representing not only but mostly the broad scope of constituent interests. An indigenous Danish, Norwegian, and Swedish term, Ombudsman is etymologically rooted in the Old Norse word umboðsmaðr, essentially meaning “representative”. In its most frequent modern usage, an ombudsman is an official, usually appointed by the government or by parliament but with a significant degree of independence, who is charged with representing the interests of the public by investigating and addressing complaints reported by individuals. Modern variations of this term include “ombud”, “ombuds”, “ombudsperson”, or “ombudswoman”. Whether appointed by the legislature, the executive, or an organization (or, less frequently, elected by the constituency), the typical duties of an ombudsman are to investigate constituent complaints and attempt to resolve them, usually through recommendations (binding or not) or mediation. Ombudsmen sometimes also aim to identify systemic issues leading to poor service or breaches of people’s rights. At the national level, most ombudsmen have a wide mandate to deal with the entire public sector, and sometimes also elements of the private sector (for example, contracted service providers). In some cases, there is a more restricted mandate, for example with particular sectors of society. A more recent development has been the creation of specialised Children’s Ombudsman agencies (see separate article). In some jurisdictions an ombudsman charged with the handling of concerns about national government is more formally referred to as the “Parliamentary Commissioner” (e.g., the United Kingdom Parliamentary Commissioner for Administration, and the Western Australian state Ombudsman). In many countries where the ombudsman’s remit extends beyond dealing with alleged maladministration to promoting and protecting human rights, the ombudsman is recognized as the national human rights institution. The word ombudsman and its specific meaning have been adopted in various languages, including Spanish, Dutch and Czech. The post of ombudsman had by the end of the 20th century been instituted by most governments and by some intergovernmental organizations such as the European Union. In some countries an Inspector General, Citizen Advocate or other official may have duties similar to those of a national ombudsman, and may also be appointed by the legislature. Below the national level an ombudsman may be appointed by a state, local or municipal government, and unofficial ombudsmen may be appointed by, or even work for, a corporation such as a utility supplier or a newspaper, for an NGO, or for a professional regulatory body. So what do you reckon about this little lot then? Please forward to me at the below address copies of all the documents that have been generated as a result of your “investigation” into my complaint of 23 May 2011 that Sergeant Colin Wright had falsified certain aspects of his 5-10-10 Jobsheet about his conversation with Dr David Barton concerning the attempted murder of my cat by Stephen Poynter. PS When are you going to keep your promises to respond to me regarding the Judge Clapham decision, and also my complaint that Sergeant Colin Wright had used false pretences to gain entry to my home address and then refused to leave when ordered to do so under the Trespass Act? One more thing, I hold you personally responsible for the continuous threat Stephen and Suzanne Poynter and their agents posed to the health and safety of my family and myself during their four-year intimidation campaign. Your cosy little arrangement with Stephen Poynter that he would warn the police but not my wife or I that he was about to discharge firearms in our near vicinity proves that you were a fully involved accomplice in the Poynters` concerted attempts to frighten us off 22A Paterson Street. MacLeod replied that he would respond shortly. Then I got this from “the fixer/spy/liar” Inspector Greg Hudson. Instead of contacting the Privacy Commissioner I contacted the Ombudsman. Thank you for your letter of 26 October 2011. 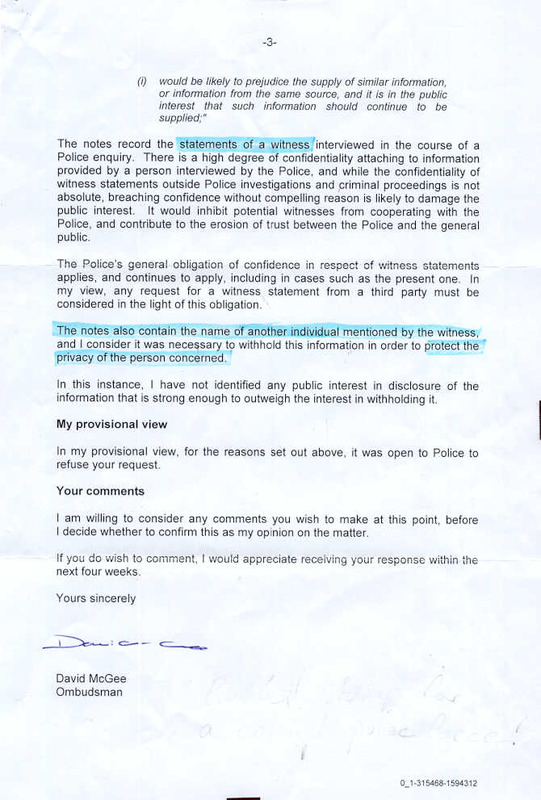 The only reason I am being denied that single page of notes is because the Police are protecting evidence fabricator Sergeant Colin Wright and malicious shooter Stephen Poynter from justice. All that claptrap about people’s privacy and police sources being protected is typical of the deceitful excuses the police trot out each time one of their own is in the frame. I suspect that Doctor Barton, in an effort to get it all to go away, told Inspector Hudson what he wanted to hear: IE that Sergeant Wright’s Job Sheet is an accurate account of what he told him during a phone conversation thereby making my allegation that Sergeant Wright fabricated vital parts of his Job Sheet look like a lie. Unfortunately for Dr Barton, the Police in general and Sergeant Wright in particular, I have incontrovertible proof that my version of events is the correct one. Doctor Barton didn’t shy away from making me look like a liar so he shouldn’t get too uppity when I show that in this instance it is he that is not telling the truth. Notice how the Police haven’t charged me with making a false statement/allegation or wasting police time. That fact alone speaks volumes. Attached is the form you asked me to fill out. You’ll see that I’ve left it blank because I have but two things to say about the service you have given me. 1 Anyone who mentions the IPCA in anything other than a derisory tone is either corrupt or ignorant. 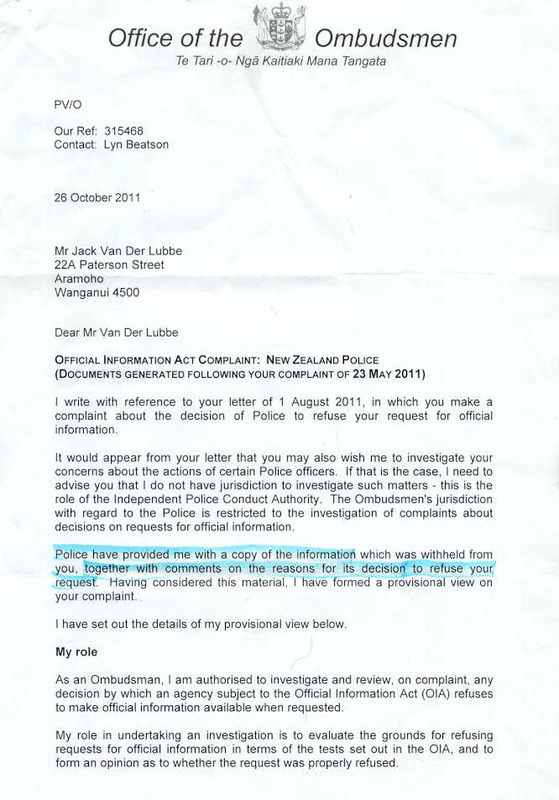 2 I won’t be contacting you in future unless you assure me that you will never again take at face value anything the NZ Police say to you. 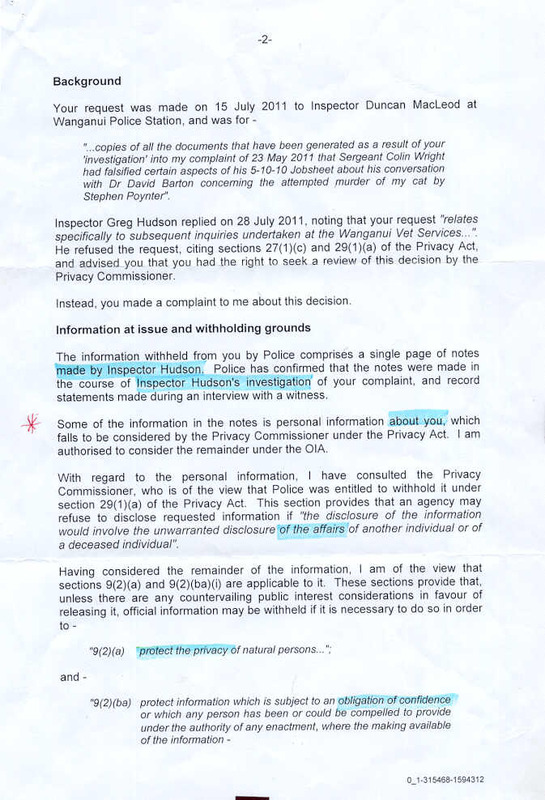 SO I THOUGHT I’D GIVE THE PRIVACY COMMISSIONER A TRY AND BOOM HUDSON AND McGEE ARE FULL OF CRAP. “All that claptrap about people’s privacy and police sources being protected” totally rubbished. It looks a lot like the reasons you gave for refusing to supply me with the attached document were bogus Greg. 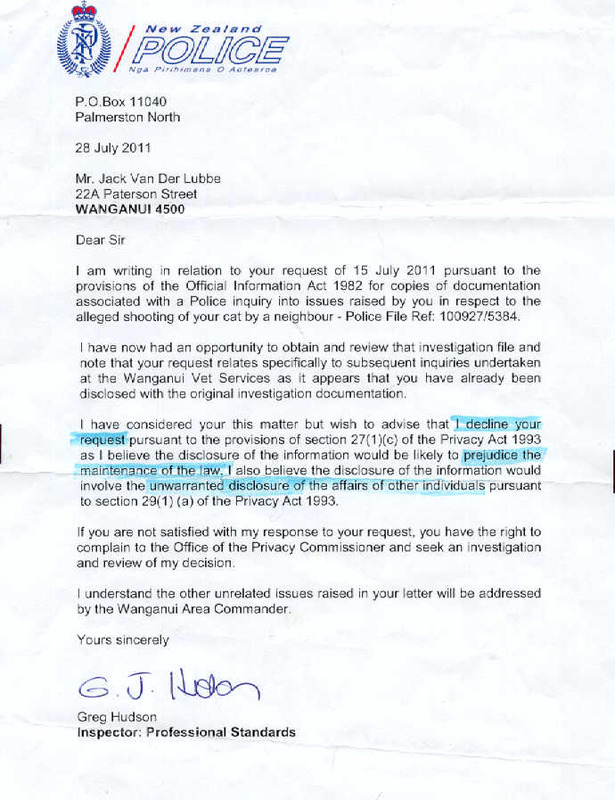 One word from the Privacy Commissioner and boom your integrity was shot to bits. However I did as you suggested and got my cat x-rayed and guess what, “snowstorm”. The x-ray negatives (I’ve got them) and attached Patient Clinical History report prove that I was right and your Sergeant Wright and both vets mentioned in your “investigation” notes were wrong. “99% sure it wasn’t [shot] as only grit was found in wound” my arse. Is that what David Barton actually said to you Greg or were you “doing a Wright” and making stuff up again? Have a look at the attached Genevieve Clement letter and then ask yourself, are she and David Barton as foolish as Colin Wright is bent? 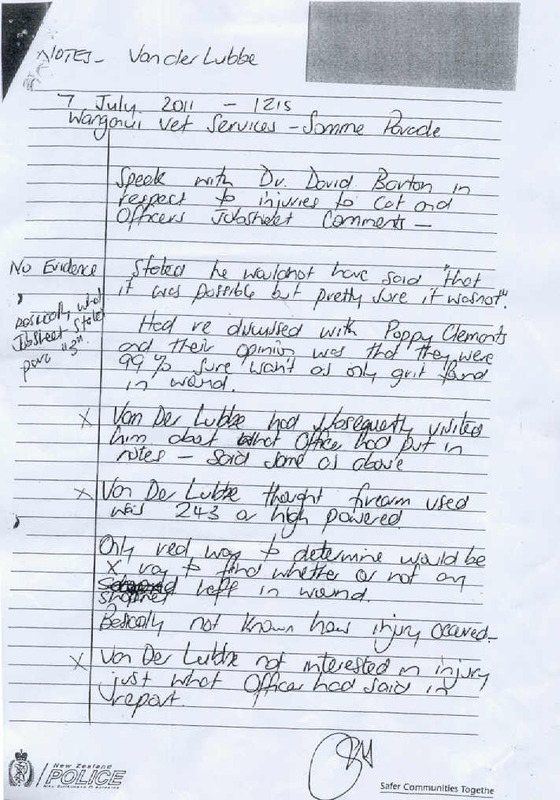 There is and always was evidence to show that my cat was shot but it was never Wright’s intention to act without fear or favour and make a proper investigation was it? Protect mad gunman Stephen Poynter was/is the name of the game! Are you going to charge Sergeant Colin Wright for wilfully attempting to obstruct, prevent, pervert or defeat the course of justice or are you going to make me do it? You really should do something about your assistant “ombudsman” Mr David McGee. He needs terminating without delay! He’s supposed to be an independent arbiter but he’s nothing of the sort. 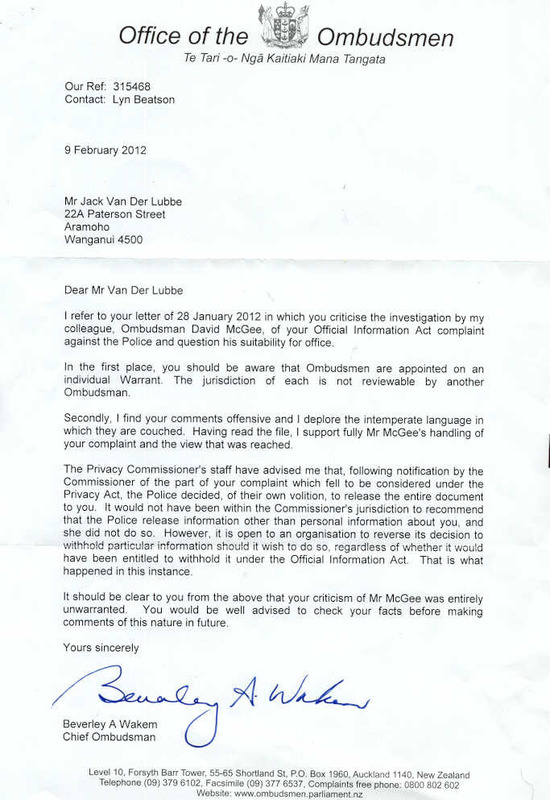 It is quite clear to me that Mr McGee is but a rubber stamp for an obstructive and dishonest police force. 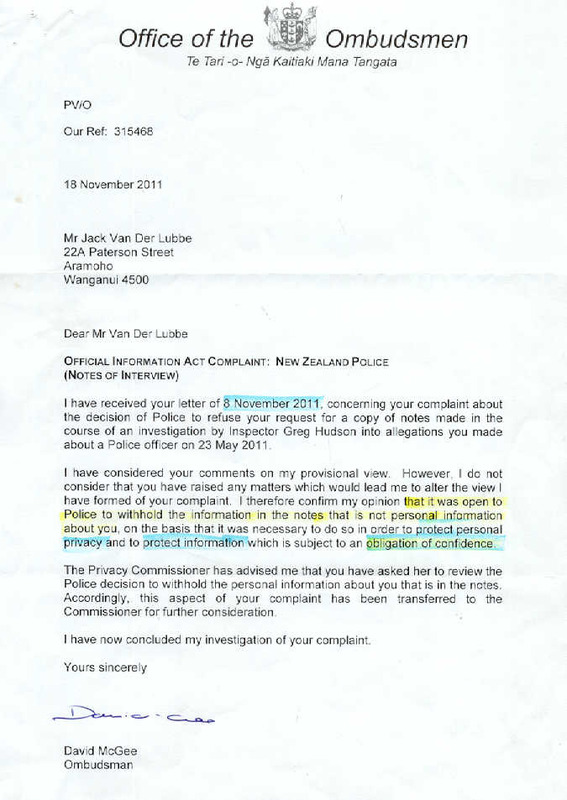 It only took one letter to Police National Headquarters from the Privacy Commissioner pointing out the folly of their obstructive stance to reverse the Police’s refusals to supply me with the attached official document and render your Mr McGee’s brownnosing decision null, void and stupid. I trust you will send the corrupt Mr McGee down the road without a golden handshake. I refer to your letter of 9 February 2012. 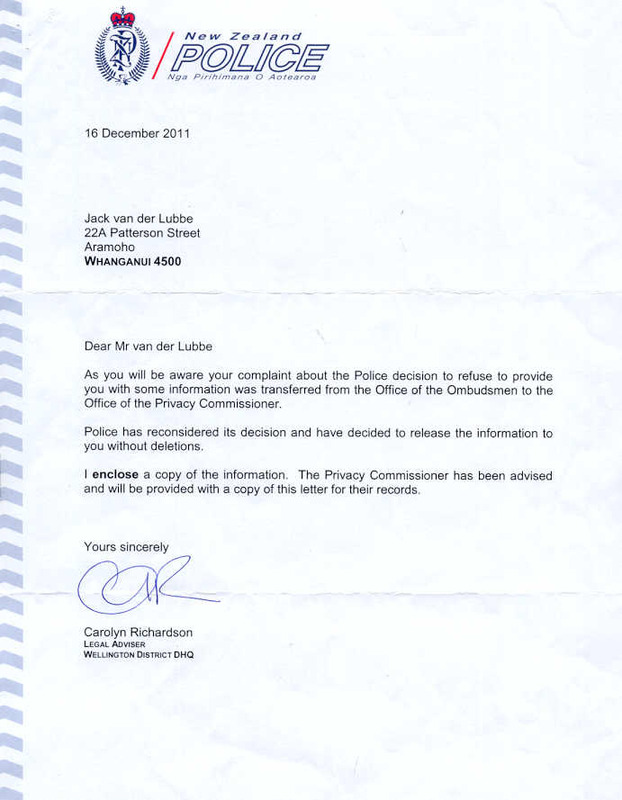 Use offensive and deplorably intemperate language in my letter of 28 January 2012 did I? Say that David McGee is a stupid, brownnosing rubberstamp did I? Is that all you’ve got to complain about? I should be so lucky! Would you resort to writing letters rebuking the people who are charged by Parliament to make sure mongrel cops don’t continue to abuse human rights and the law? Or would you see nothing, hear nothing, say nothing and turn the other cheek and run like a wartime Jew to the killing pits? It is very fortunate for all concerned that I have the patience of Job and that my only weapon is the sometimes “intemperate” printed word. I bet you can’t point out one sentence in those notes that should have been withheld from me under the Privacy Act Sections that Hudson quoted. The fact that Carolyn Richardson saw fit to release to me the entire page without deletions shows that there is nothing in it that can be honestly withheld under the provisions of the Privacy or any other Act and it also shows that Hudson, McGee and now you were all wrong; that your support of McGee is wrong; that McGee’s decision to back bent cop Hudson was wrong and it also shows that it isn’t only dopey David McGee that should be given a swift kick up the bum. Pffft! Ombudsman, you don’t know the meaning of the word. WHAT A BUNCH OF BULLSHITTING WANKERS THE OMBUDSMAN’S OFFICE TURNED OUT TO BE! THEY WERE BENT COP LOVERS BACK IN 1987 AND THEY OBVIOUSLY HAVEN’T CHANGED FOR THE BETTER SINCE THEN. A BIT OF YOU OWN MEDICINE! 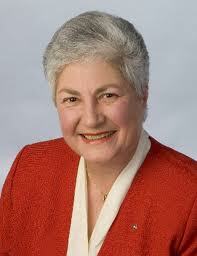 Dame Beverley Wakem was injured when a taxi reversed and knocked her down. A taxi driver who reversed into Ombudsman Dame Beverley Wakem, sending her crashing to the road and breaking her leg, has been discharged without conviction. Wakem, 71, was “horrified” and “gobsmacked” when she heard the outcome of the prosecution of taxi driver Gurpreet Singh, 33, in Wellington District Court on Wednesday. Wakem, whose job is often described as being the public watchdog, said she was in total pain and misery as a result of being knocked over in The Terrace on February 20, but did not want a “big song and dance” made about it. Wakem caught a taxi because of the sensitive nature of papers she was carrying. She had been chatting with Singh as he drove her, and knew that he had a wife and a young child. She felt sorry for him after she was injured, and at first told police she did not want him charged. But that was before she knew he had pleaded not guilty, and that the top of her right thigh had been broken. She needed a surgical plate and pins to repair the break, and falling on the road caused a previous lower back problem to flare again. Life was now miserable, and the pain meant she slept poorly. She finally got off crutches recently, but faces more treatment and cannot drive. The few bright spots were that ACC had been “superb” in dealing with her case, and she enjoyed getting to know her local Driving Miss Daisy driver. She is working fulltime, but some of it is done from home. Wakem said that, because of an earlier incident when a taxi reversed towards her, she took special care leaving the taxi. “Bugger me, I got out of the cab, waited for a considerable amount of time on the pavement.” She was a couple of yards from the back of the taxi when she saw it coming towards her. Singh looked behind him twice, but Wakem moved in between those times, lawyer Jonathon Miller said. After initially intending to defend the charge, Singh pleaded guilty to careless driving causing injury. Miller said Singh had been advised he had a defence to the charge, but did not want Wakem to have to give evidence and wanted the case over. Wakem was named on court papers, but was not referred to by name at the hearing. Police did not oppose Singh’s discharge without conviction, based in part on Wakem’s first reaction to what happened. Judge Paul Kellar said the incident was no doubt serious for Wakem, but Singh had looked both ways, checked the rear-view mirror and reversed slowly. There was “very little fault” on Singh’s part and, if he was convicted, his family would lose their only income for at least six months. The New Zealand Transport Agency, which regulates taxis, would still know of the incident, even though there was no conviction, the judge said. It could separately consider Singh’s fitness to drive taxis. The judge discharged Singh without conviction on condition he pay $350 to the Salvation Army. His was the only discharge without conviction granted out of the four that were sought from the judge on Wednesday. After the hearing, Singh said the accident had not put him off taxi driving, but it had made him sad.